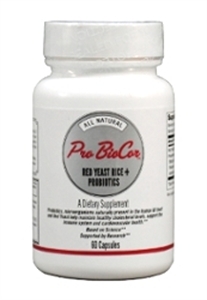 Pro BioCor containing red yeast rice can manage bad LDL cholesterol levels, good HDL cholesterol levels and triglyceride levels. It provides an alternative for individuals intolerant to statins or those seeking an all natural remedy to manage cholesterol. Red yeast rice is a product of fermentation of rice with a strain of yeast called Monascus Purpureus. It has been used in the U.S. as a natural alternative to manage cholesterol since the early 90s. The Chinese have been using red yeast rice for over 1000 years. Most notable uses were for digestion, re-invigorating blood and as a food coloring agent for such Chinese dishes as Peking Duck. Red yeast rice contains naturally-occurring substances called monocolins. One particular monocolin called Lovastatin is believed to be converted in the body to a substance that inhibits HMG-CoA reductase, an enzyme that triggers cholesterol production. The cholesterol effect of red yeast rice has been found to be greater than that obtained from equivalent doses of the pharmaceutical form of lovastatin (Mevacor). This is due to the presence of other substances in red yeast rice besides the HMG-CoA reductase inhibitors that have hypocholesterolemic activity, for example phytosterols. It works in the same fashion as cholesterol drugs like Mevacor but in a much gentler way. Probiotics are live microorganisms known to be healthy for us, the host organism. They help the good organisms in your body grow and protect your intestines against bad organisms that can make you unwell. There are over 50 different strains of probiotics. Pro BioCor contains specific strains that have proven cholesterol activity. These probiotic strains also provide a wide range of additional benefits. Individuals supplementing with Pro BioCor may experience improved digestion, intestinal health and more consistent bowel movements. Pro BioCor may also decrease inflammation which can alleviate aches, pains and arthritic symptoms. For cardiovascular health decreased inflammation can benefit the arteries, allowing cholesterol to pass through more freely. When arteries are inflamed it can lead to increased plaque buildup (atheroschloleoris). Pro BioCor will also boost the immune system which can help reduce everyday threats to our well being. The ingredients in Pro BioCor are not available in any other product. It is the most effective product for lowering cholesterol offered by Real Natural Remedies.